According to the Chinese tradition, at the very beginning of a new year, when there is a bright full moon hanging in the sky, there should be thousands of colorful lanterns hung out for people to appreciate. At this time, people will try to solve the puzzles on the lanterns and eat yuanxiao (glutinous rice ball) and get all their families united in the joyful atmosphere. Until the Sui Dynasty in the sixth century, Emperor Yangdi invited envoys from other countries to China to see the colorful lighted lanterns and enjoy the gala（节日的，庆祝的）performances. By the beginning of the Tang Dynasty in the seventh century, the lantern displays would last three days. The emperor also lifted the curfew（宵禁令）, allowing the people to enjoy the festive lanterns day and night. It is not difficult to find Chinese poems which describe this happy scene. In the Song Dynasty, the festival was celebrated for five days and the activities began to spread to many of the big cities in China. Colorful glass and even jade were used to make lanterns, with figures from folk tales painted on the lanterns. However, the largest Lantern Festival celebration took place in the early part of the 15th century. The festivities continued for ten days. Emperor Chengzu had the downtown area set aside as a center for displaying the lanterns. Even today, there is a place in Beijing called Dengshikou. In Chinese, Deng means lantern and Shi is market. The area became a market where lanterns were sold during the day. In the evening, the local people would go there to see the beautiful lighted lanterns on display. Today, the displaying of lanterns is still a big event on the 15th day of the first lunar month throughout China. People enjoy the brightly lit night. Chengdu in Southwest China's Sichuan Province, for example, holds a lantern fair each year in the Cultural Park. During the Lantern Festival, the park is literally an ocean of lanterns! Many new designs attract countless visitors. 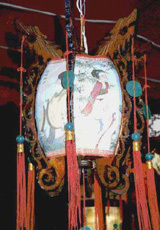 The most eye-catching lantern is the Dragon Pole. This is a lantern in the shape of a golden dragon, spiraling up a 27-meter -high pole, spewing fireworks from its mouth. It is quite an impressive sight! 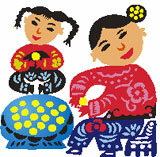 There are many different beliefs about the origin of the Lantern Festival. But one thing for sure is that it had something to do with religious worship. One legend tells us that it was a time to worship Taiyi, the God of Heaven in ancient times. The belief was that the God of Heaven controlled the destiny of the human world. He had sixteen dragons at his beck and call and he decided when to inflict drought, storms, famine or pestilence（瘟疫）upon human beings. Beginning with Qinshihuang, the first emperor to unite the country, all subsequent emperors ordered splendid ceremonies each year. The emperor would ask Taiyi to bring favorable weather and good health to him and his people. Emperor Wudi of the Han Dynasty directed special attention to this event. In 104 BC, he proclaimed it one of the most important celebrations and the ceremony would last throughout the night. Another legend associates the Lantern Festival with Taoism. Tianguan is the Taoist god responsible for good fortune. His birthday falls on the 15th day of the first lunar month. It is said that Tianguan likes all types of entertainment. So followers prepare various kinds of activities during which they pray for good fortune. The third story about the origin of the festival is like this. Buddhism first entered China during the reign of Emperor Mingdi of the Eastern Han Dynasty. That was in the first century. However, it did not exert any great influence among the Chinese people. one day, Emperor Mingdi had a dream about a gold man in his palace. At the very moment when he was about to ask the mysterious figure who he was, the gold man suddenly rose to the sky and disappeared in the west. The next day, Emperor Mingdi sent a scholar to India on a pilgrimage（朝圣）to locate Buddhist scriptures. After journeying thousands of miles, the scholar finally returned with the scriptures. Emperor Mingdi ordered that a temple be built to house a statue of Buddha and serve as a repository for the scriptures. Followers believe that the power of Buddha can dispel darkness. So Emperor Mingdi ordered his subjects to display lighted lanterns during what was to become the Lantern Festival. Besides entertainment and beautiful lanterns, another important part of the Lantern Festival,or Yuanxiao Festival is eating small dumpling balls made of glutinous rice flour. We call these balls Yuanxiao or Tangyuan. Obviously, they get the name from the festival itself. It is said that the custom of eating Yuanxiao originated during the Eastern Jin Dynasty in the fourth centuty, then became popular during the Tang and Song periods. The fillings inside the dumplings or Yuansiao are either sweet or salty. Sweet fillings are made of sugar, Walnuts（胡桃）, sesame, osmanthus flowers（桂花）, rose petals, sweetened tangerine peel, bean paste, or jujube paste（枣泥）. A single ingredient or any combination can be used as the filling . The salty variety is filled with minced meat, vegetables or a mixture. The way to make Yuanxiao also varies between northern and southern China. The usual method followed in southern provinces is to shape the dough of rice flour into balls, make a hole, insert the filling, then close the hole and smooth out the dumpling by rolling it between your hands. In North China, sweet or nonmeat stuffing is the usual ingredient. The fillings are pressed into hardened cores, dipped lightly in water and rolled in a flat basket containing dry glutinous rice flour. A layer of the flour sticks to the filling, which is then again dipped in water and rolled a second time in the rice flour. And so it goes, like rolling a snowball, until the dumpling is the desired size. The custom of eating Yuanxiao dumplings remains. This tradition encourages both old and new stores to promote their Yuanxiao products. They all try their best to improve the taste and quality of the dumplings to attract more customers. None of this material may be used for any commercial or public use. Reproduction in whole or in part without permission is prohibited.